The new online pokies for Game of Thrones has landed and you will be taken on an adventure to the Kingdoms of Westeros to gain control of the empire through winning combinations and big payouts. This game is themed on the popular HBO TV series where you can win free spins and great bonuses await. You will no doubt recognize the award winning music in the background. First of all look out for the wild symbols which appear stacked on all five reels and can spin up some big wins. The Iron Throne symbols is the scatter scatters and are key to the kingdom of free games. When you win the free spins you can select between..
You can also choose to gamble your winnings after any win. 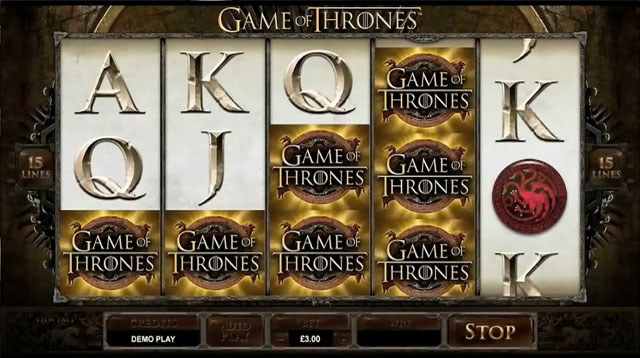 This Game of Thrones pokies game features 243 ways to win over 5 reels with auto play and gamble function.